You can use any gluten-free flour you have or a gluten-free flour mix. One day when I was making a pie for a potluck I didn’t have enough gluten-free flour mix – panic! I buzzed some oatmeal in my blender until it was the consistency of flour and my crust turned out fine. Whew! What does seem to make a difference though is to use a mix that contains rice flour (brown rice flour is fine) or add some brown rice flour to your mix. Don’t skip the vinegar. You won’t taste it and it tenderizes the crust. Place one or two ice cubes in a shallow cup. Add water, no need to measure it at this point. Combine flour and salt in a medium bowl. Cut in butter with a pastry blender or two knives until mixture is crumbly. Alternatively you could buzz it in a food processor. Use a fork to form a well in center. Add egg and whisk to blend without incorporating into the flour. Add the vinegar, stirring gently with the fork until just blended. Use a tablespoon to measure and drizzle 3 tablespoons of the water over the flour, mixing with a fork and then clean hands until the dough just holds together and forms a ball. If you need to add the fourth tablespoon of water, do so. Be careful not to add too much water though as the dough will be hard to roll. Shape dough into a ball. Place on a lightly floured sheet of wax paper or parchment paper. Use your hands flatten slightly. Top with an additional piece of wax paper. Roll out dough until it’s about 3 inches larger than your pie plate. Remove top sheet of wax paper and invert dough into pie plate. Slowly peel away wax paper. Turn edge under and crimp if you desire. As you can see, I left my edges rustic. The dough is easiest to roll and work with when used soon after preparing it. If you won’t be making your pie right away you can cover the crust-filled pie plate and store in the fridge. If you need a prebaked crust, preheat oven to 400° F. Bake for 15 to 18 minutes or until crust is set and a light tan color. 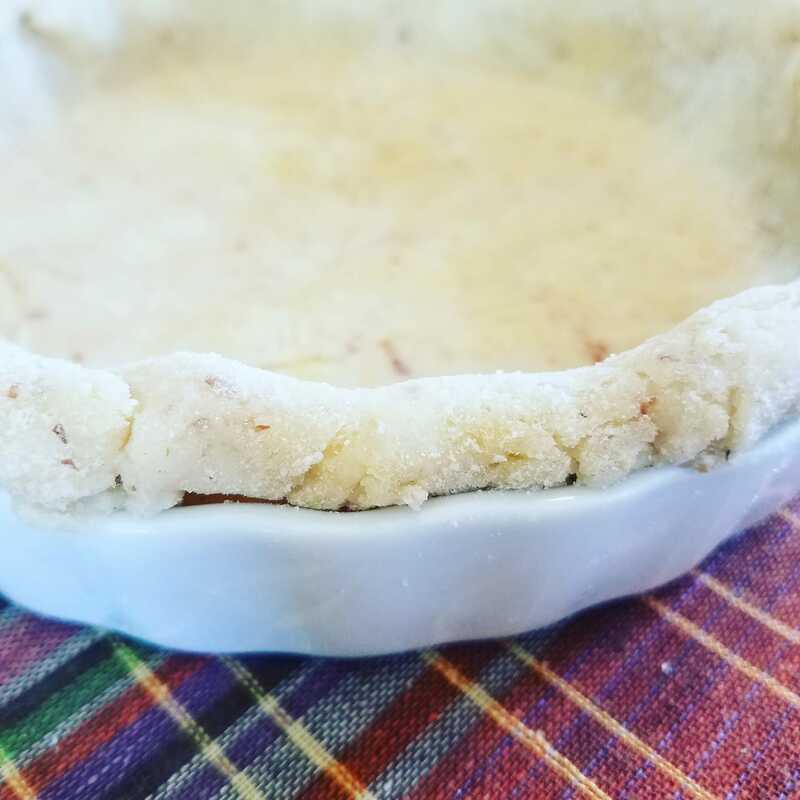 Sweet Pie Crust: add the equivalent of two teaspoons sugar or sugar substitute when stirring in the salt.